Tools for all modules are available for $1795 + $360 per year, a single module's tools for $1195 + 240 per year. Productivity Tools extend the functionality of Sage 300 (Accpac). This product is written as an SDK Application, integrating seamlessly with the desktop, activation and security features of Sage 300. Download PDF Handout. New Internet Integrations: Launch Google Maps, an email client or a website from dozens of locations. SmartFinder searches for customers&comma; vendors&comma; items&comma; orders&comma; and more like an internet search engine. Searches multiple fields and multiple tables however they are ordered. 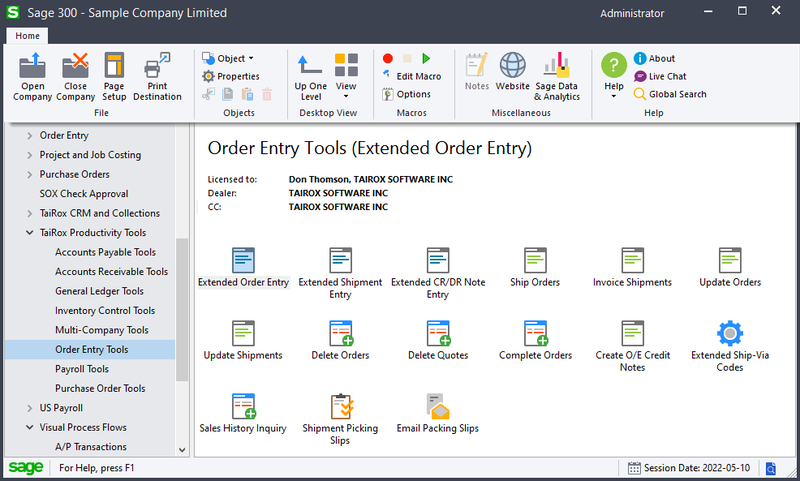 See user guides for examples: Extended Order Entry. Extended G/L Segment Codes copies Segment Codes from one company to many. Extended G/L Account Groups copies Account Groups from one company to many. Extended Create New Year creates a new year in multiple companies. Set Recurring Dates resets incorrectly entered last-run-dates. User Management copies permissions and setup from one user to another. Extended Customer Inquiry adds SmartFinders, Google Map integration, multiple contacts and other functionality to Customer Inquiry. Extended AR Receipt Entry searches for a customer by invoice number providing a solution for the receipt of a payment that identifies an invoice, but does not identify a customer. Extended Ship-To Locations provides access to Extended Ship-To Location, which will optionally enforce Country, State and Province codes. SmartFinder searches for customers like an internet search engine. Extended Create Payment Batch enables more than one system generated batch to be unposted. Extended Remit-To Locations provides access to Extended Remit-To Location, which will optionally enforce Country, State and Province codes. 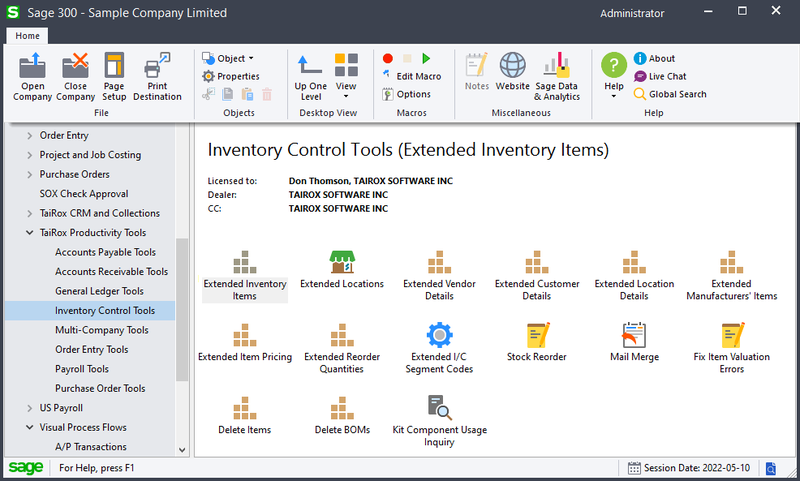 Extended Inventory Items copies items, changing segments, from one company to many. Includes many options to filter, log changes, increase speed & safety. An Item In Use button will show all table references to an item. SmartFinder searches for items like an internet search engine. Extended Locations copies Locations from one company to many and provides links to Google Maps and email clients. Extended I/C Segment Codes copies segment codes from one company to many. Extended Vendor Details, Extended Customer Details, Extended Manufacturers' Items SmartFinder searches for items like an internet search engine. Extended Item Pricing copies prices from one company to many. Stock Reorder performs reorder calculations, previews with errors (e.g. no item vendor). Saves display grid to Excel and reloads edited spreadsheet. Creates either purchase orders or requisitions. Mail Merge creates mail-merge documents directly from Sage 300. Simplifies operation by eliminating export and data source setup. Merges ACTIVE instead of 1, calculated fields. Eliminates guesswork by providing meaningful field names. Delete Items provides a way to see all inventory items that are safe to delete. Checks for known third party references to items. Deletes items when safe to delete. Delete BOMs provides a way to delete hundreds of old or unused Bills-of-Material (BOMs) in one operation. Fix Item Valuation Errors repairs item valuation errors in your data. Extended Shipment Entry shows prices, quantities and comments when selecting items. Shows margins and most recent costs. A ship button displays picked items in picking slip order. Settings enable quick printing of picking slips without showing intermediate windows. Displays quantities available at other locations or companies. Extended Ship-Via Codes copies Ship-Via Codes from one company to many and provides links to Google Maps and email clients. Update Shipments updates prices or ship dates for hundreds of shipments. Sales History Inquiry quickly finds most recent costs and prices for an item. Extended PO Receipt Entry shows item quantity information just like on the order entry screen. A receive button displays items on the PO in several different sort orders. Drop ship to dozens of detail lines in a single operation. Display quantities available at other locations or in other companies while entering a receipt. SmartFinder searches for Receipts and vendors and items like an internet search engine. 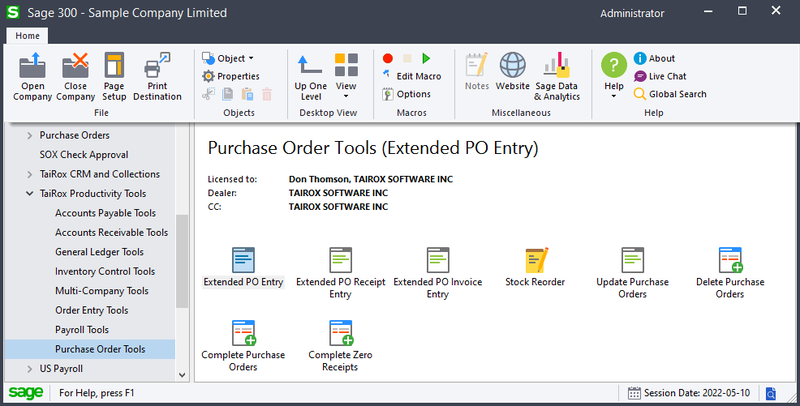 Extended PO Invoice Entry shows all receipts related to a vendor so that they may be quickly matched to an invoice. A vendor is related to a receipt if they are the primary vendor or an additional cost vendor. Update Purchase Orders updates vendor costs for hundreds of purchase orders. Updates expected arrival dates for hundreds of purchase orders. Sync Timecards synchronizes timecard data with updated master table entries. Includes many options to filter employees, logs all changes. 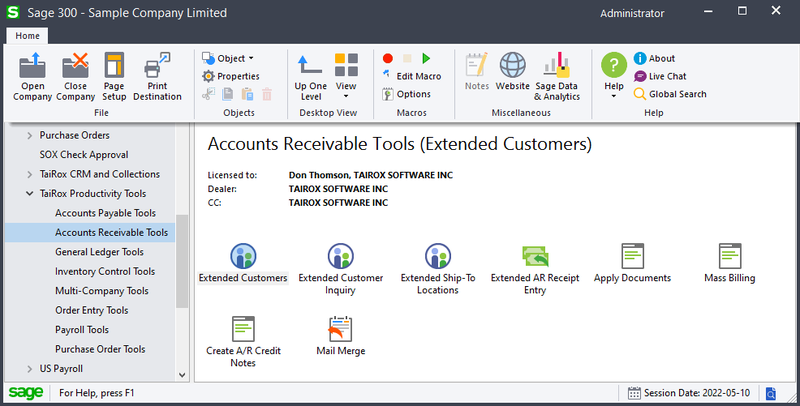 • Sage ERP Accpac version 5.6 or 6.0 or Sage 300 2012, 2014 or 2016: A single executable program, installed using Setup.msi, works with these platforms. 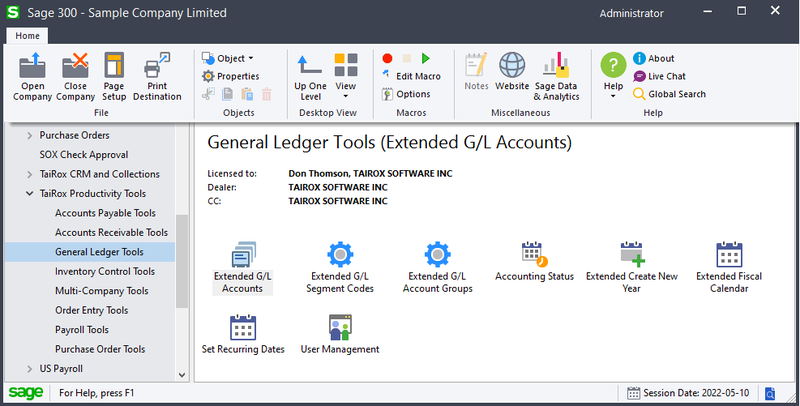 • Sage 300 2017, 2018 or 2019: A single executable program, installed using Setup2017-2019.msi, works with these platforms.